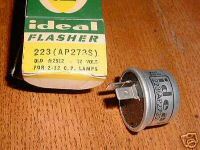 This 129AE flasher is new, NOS, Aluminum can. This flasher has Black lettering on the can as pictured. 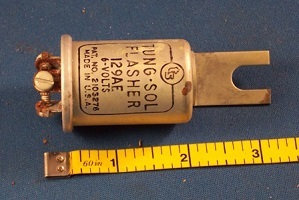 A Tung sol brand flasher, round and tall in shape and in mint condition. 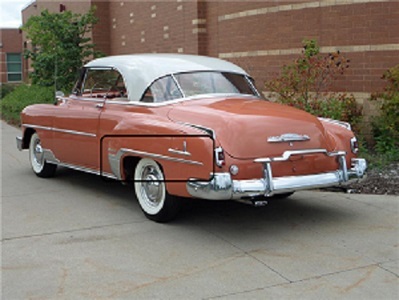 It is a 3 terminal flasher with the terminals in an unusual configuration. This flasher will not plug into a female flasher plug. Many of these NOS flashers have 2 or sometimes 3 different numbers associated with them, and many times lettered on the canister. All these number are correct for identification. The 2 0r 3 different numbers are just the manufacturers parts numbers that get changed from time to time. I do not know why. They call this “superseded numbers”.